As you browse through our online store, please pay close attention to our Isotonix® line of supplement products. In order for meaningful absorption of nutritional content to take place, all food must be converted into an isotonic state, a process that could take up to three hours, which limits the amount of nutrients absorbed by the body. 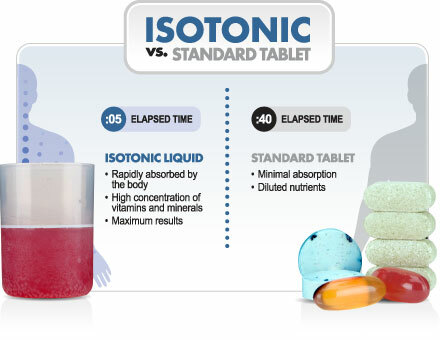 But Isotonix® products are scientifically formulated with the perfect balance of fructose, d-glucose, citric acid, potassium bicarbonate and other ingredients to ensure that they are isotonic the moment they enter your body. When properly mixed with water and taken on an empty stomach, the isotonic solution flows into your small intestine almost immediately. With the nutraMetrix® Isotonix® products, little nutritive value is lost, making the absorption of nutrients highly efficient while delivering maximum results.